So you’re thinking of buying a house with solar PV already installed and wondered how much, if anything, they add to the price you will have to pay. In the article below we’ll consider some of the factors at work and discuss some valuation challenges around this issue. 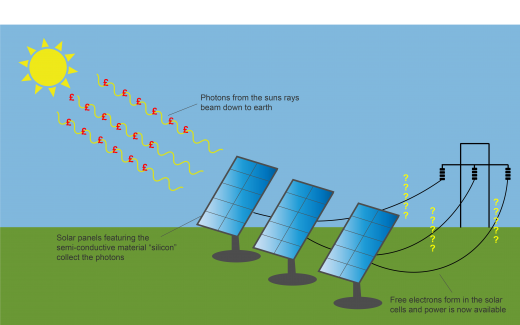 This is not as simple a subject as many people think and is dependent to a degree on when the solar panels were installed. This is because the Feed-in-tariffs (FIT’s) have changed over the years and as such the amount of revenue generated has also changed. Furthermore the cost of installation has, to a degree as a result of demand factors caused by the change in FIT’s, reduced significantly since the project started some years ago. Notwithstanding the above Solar PV can still be an attractive option for some homeowners and this is despite the fall in the FIT’s and if you are buying a property with them already installed, then as long as the maintenance/insurance costs are less than any revenue you receive, then prima facia it seems like a sound investment. Using an example. Assuming a FIT’s return of say £800 per annum, then the present value of such an income is calculated by reference to other low risk investments. 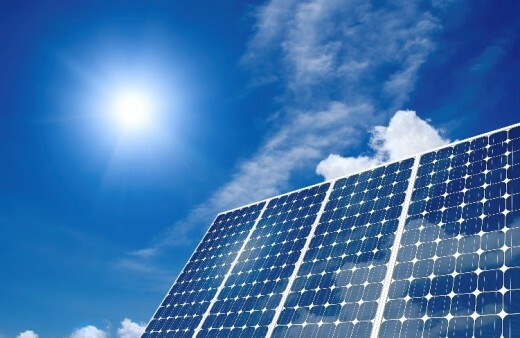 Solar PV systems may be considered relatively low risk as the income is paid effectively by the UK Government and so long as the panels, as well as the revenue received, is adequately insured, then the income should remain relatively stable during the course of the investment period. The tariff levels are normally index-linked so they will track the retail price index. Assuming an investment return of say 2% per annum, (a low yield to reflect lower levels of risk), the present value of an £800 income for say 20 years could be iro £13,000. This figure excludes any insurance or maintenance costs, so is a gross figure. However is this reflected in the purchase price, not always! Sellers and their Estate Agents don’t tend to take into account the full effect of the revenue potentially generated by the presence of solar PV on their property. The FiT’s normally go to the person who owns the panels, whether that be the resident or a third party who owns the panels and as the FiT’s are what generate the investment value, then the value of the panels is wholly dependent upon where in the cycle the property is, i.e. what level of FiT is payable and from when. So not only is the length of time left on the investment important, but so is the point at which it started. The reason for this is the FiT payments have reduced dramatically since the scheme began, for instance in October 2011, the amount paid for each unit of electricity produced from the solar PV system was 43.3p / kWh. Now (as at January 15) the rates are just 13.88p / kWh. In addition the payment period was previously 25 years, whereas modern systems have a shorter period of circa 20 years. As a result if the installation was installed earlier on in the scheme lifecycle, then the value of the FiT was higher and as such the return on investment (ROI) could also be higher. There is a counter to this however, e.g. older panels may not now produce as much power per square metre as more modern systems due to improved materials and technology, along with the fact that the panel energy production rates do reduce over time. This complicates the valuation exercise even more! As the solar PV system doesn’t only provide an investment, but can also produce energy to help power the home, then the cost of electricity used has an impact on the investment return and is much more difficult to calculate due to fluctuating energy costs. Furthermore, recent developments in systems allow for some/all of spare capacity to be used to power say a hot water heating system and thus to effectively reduce the amount of gas used to heat hot water/heating systems. Again, this is difficult to estimate with any degree of accuracy by a seller or Estate Agency Valuer when trying to estimate the marketing value of a particular property. In valuation terms the more unknowns there are the higher the risk to the return and as such the higher the yield expected by an investor, investment theory being essentially that the higher the risk you accept, the quicker return you want and as such the higher the investment yield needs to be. Insurance of the solar panels is again another unknown factor and as the cost affects the investment return, then the assessment of capital value is also affected. For instance does it cost the same to insure panels on a low level property in a relatively sheltered location compared to a say four storey block in an exposed location? These factors, again, make it difficult for an Estate Agency Valuer to assess the capital value of the investment and as such how much (if anything) should be allocated against the marketing valuation. The valuation of solar panels on a residential property is not a straightforward exercise, there are various factors to account for, some are difficult to assess and as such to simply use the known investment return i.e. amount of FiT received each year, is inherently risky. However as a ‘rule of thumb’ using the last 3 years say of investment return could give you a good idea of how much you will make in cash and also potentially save against your energy costs, as such allow you to roughly estimate potential future return. However don’t forget to factor in the variables, along with any others you can think of, into your calculations and before making any final decision you should instruct a suitably qualified Registered Valuer to provide a formal opinion.